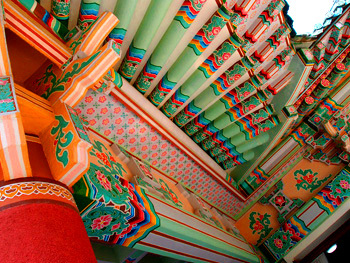 The International Friendship Exhibition Shrine IFE of The Eternal President KIM IL SUNG is a vast traditional building without windows, containing 120 rooms with over 100’000 gifts presented to him by fraternal foreign leaders from many parts of the world. 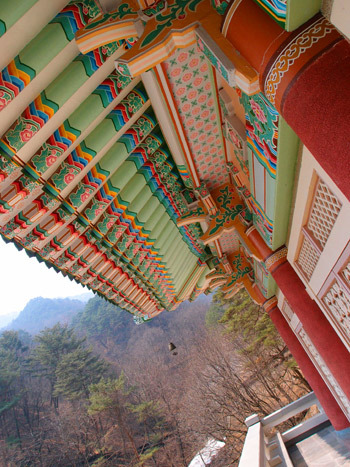 The pompous building is located in a idyllic landscape in the hills of Mt Myohyang. Before we enter the vast shrine we have to put on plastic shoe covers and are asked to show reverential attitude. We have to pass a metal detector inside and to hand over all photo and video cameras. Taking pictures is strictly forbidden. My iPhone was already sealed. Ursula was “honored“ to open the huge doors that led us inside the temple like monument after she put on ceremonial gloves to protect the golden shine of the door knob. Beside our “permanent” guide we were joined by a local guide who took us – thankfully – only through some dozen of the 120 enormous gift rooms. KIM IL SUNG’s gifts are like Tales from a Crypt, especially the steel armoured train carrier by his mentor and protector Mao Zedong and the three limousine cars by his close friend Joseph Stalin are noteworthy (sorry no photo). The presentation of the local guide is almost religious, the atmosphere in the windowless temple-like monument is sombre as we walk the over-polished corridors, our shoes in plastic covers. 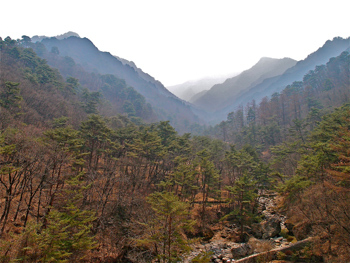 Suddenly, the tone of our local guide gets very serious and emotional. She opens the door to the most surreal of all rooms, to the final room of the exhibit. 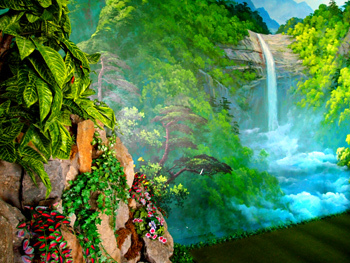 The over-life-sized waxwork of “The Eternal President“ KIM IL SUNG – a gift from the Chinese leadership – is standing in a bucolic 3D landscape with birdsong and shopping center music. We are asked to bow our heads respectfully before leaving the room. Our local guide is moved to tears. Steps to make “The Eternal President“ KIM IL SUNG into a divine figure were highly obvious analogous to the Egyptian Pharao. 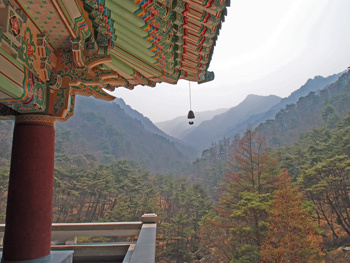 At the end of the tour through the windowless temple-like Palace, up on the terrace, we have a fabulous view of the surrounding hills of Mt Myohyang. We are asked to talk about our experience with “The Eternal President“ and write down our feelings which Ursula dutifully did. 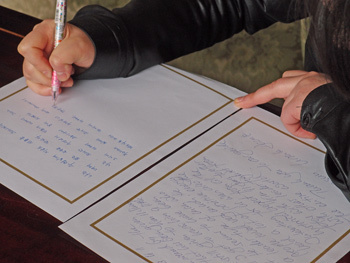 Our “permanent“ guide translated Ursula’s handwriting for the “eternal“ guestbook of KIM IL SUNG’S International Friendship Exhibition Shrine. On the other side of KIM IL SUNG’S “warehouse of gifts“ is a similarly pompous warehouse where KIM YONG IL’S gifts are stored. 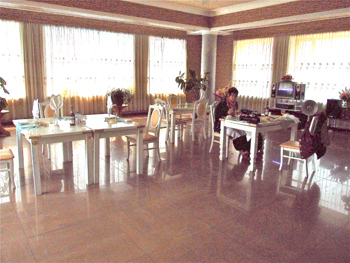 We choose to have lunch at the government restaurant close by instead of visiting KIM YONG IL’S shrine of gifts. Sitting all alone in a huge building without electricity in a cold eating hall, being served by two waitresses and surrounded by a grand idyllic wall painting, I regret not having visited the second warehouse-temple-like building of KIM IL SUNG’S son KIM YONG IL. They say that parts of the exhibit show row after row of wide-screen televisions and stereo equipment donated to “My Dear Leader“ by industrialists of foreign countries. 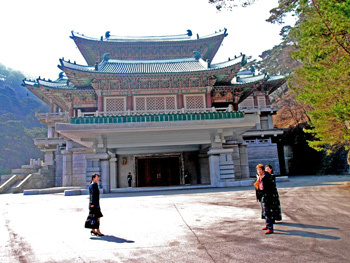 Like KIM IL SUNG’S warehouse-temple , KIM YONG IL’S ends with his statue (which I also missed unfortunately). The taste of the past was remarkably odd.